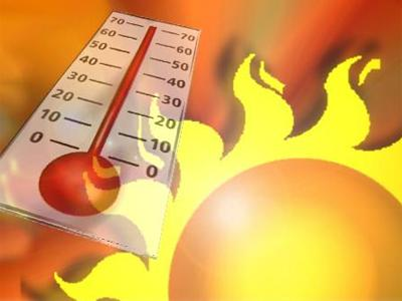 Today: Sunny, with a high near 98°and heat index values to 101°. The south wind will be 5-10 mph. Tonight: Mostly clear, with a low around 74° and S-SE wind 10 mph. Sunday: Mostly sunny with a high near 97° and heat index values as high as 101°. The south wind will be generally light at 5-10 mph. Overnight should be clear with S-SE wind at 10-15 mph and gusting to 20 mph. Next Week: On Monday we expect more sunshine and upper 90s, along with more and stronger south wind that will be about 15 mph typically and gust to 20 mph. Tuesday will be the same except…high pressure to the west and east of Central Texas may move away a little in opposite directions. That could allow some moist air and rain chances to come in from the coast for the Tuesday-Wednesday period. By Thursday it looks like hot and dry will return with a rebuilding of the high pressure.